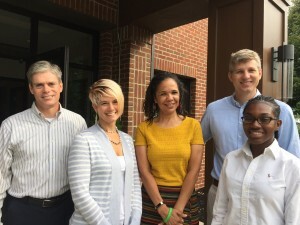 GKH summer intern Raven Clark (right) with litigation attorneys and support staff (l to r) Dwight Yoder, Allyson Keiser, Susan Clarke and Jason Asbell. GKH welcomed Raven Clark as the 2017 participant in its first annual summer internship/scholarship program for School District of Lancaster graduates. Program participants must be seniors at McCaskey High School, accepted into a four-year college degree program, and interested in pursuing a career in the legal field. Ms. Clark, as the first participant in the program, was hired for full-time employment in the summer following her high school graduation. Ms. Clark graduated from J.P. McCaskey’s honors program in the spring of 2017. Her experience working for GKH included a variety of general office tasks, special event planning, file management, and assignments from attorneys and support staff. In addition, she participated in various aspects of legal work, such as attending zoning meetings, helping to prepare filings, participating in practice group planning sessions, and serving as a witness for will and POA signings. She also had the chance to be mentored by GKH attorneys, and to build valuable connections in the legal field. In addition to being compensated as an employee, the program’s participants receive a $1,000.00 scholarship, to be used in the pursuit of an undergraduate degree. Ms. Clark plans to attend Temple University in the fall, majoring in English. For more information on the internship program for the School District of Lancaster’s McCaskey High School seniors, contact GKH.